The KG-13 Electronic Key Generator, Transmitter/Receiver was similar in appearance to the KG-14. This solid state design dating from the mid-to-late 1960's, originally cost $US 40,000 per copy. It was one of the first crypto machines to encrypt data such as facsimile. Crypto technicians received 10 to 12 weeks training on the machine. The KG-13 was comprised of a KG-3 transmitter and a KG-12 receiver. Click here for KG-13 data sheet. The KG-13 was controlled by "key cards". These were Remington Rand computer punch cards that determined the starting point of the KG-13 encryption which was done by "koken stages". Remington Rand computer punch cards used round, punched holes versus the rectangular holes found on IBM punch cards. Both style of cards were identical in size. The key cards were changed daily at HJ time. Click on image to enlarge. The "Koken Register.jpg" shows the format of these generators. Of course, the real classified part is the combiner logic and alarm system. KG13 was not the only machine to use this format. Select this link to see the inside of the card reader. Ronald Coppock, who worked with the KG-13 indicates that it was fitted with a card cutter and also without. "In Ethiopia, I worked at two locations (Stonehouse and Tract C) that had KG13's equipped with the KW26 style card cutters. All the machines at Stonehouse were equipped that way and about 20% at Tract C. At the 7th Radio Research in South East Asia, about 30% of the KG13's had the card cutter style card readers. 13's equipped with the card cutters were operated on very high priority circuits with short cycles to change key material. Some were on 6 hour and others on 12 hour cycles". The KG-13 did have a major difference in that in its latter years, it was equipped with a Card Reader Insert Board or CRIB. The KG-13 employed "FLYBALL" modules. These were modules comprised of discrete components set up as logic element circuit groups such as AND gates, OR gates, FLIP FLOPs, Inverters etc. 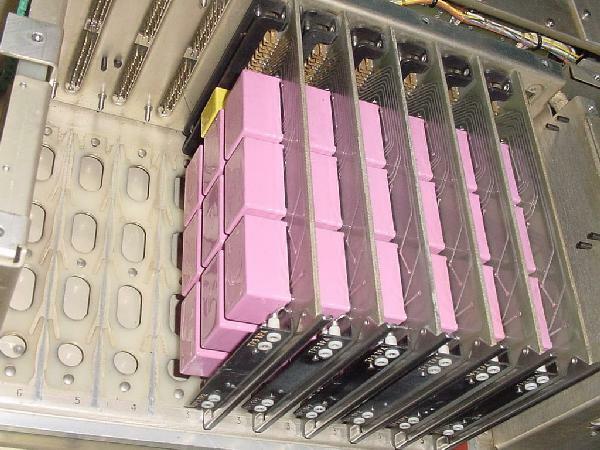 Once tested, the modules were potted in a compound whose colour indicated functionality. The coloured potting compound was extremely hard and any attempt to penetrate it resulted in damage to the internal circuitry. In a KG-13, the following colours are confirmed: Pink, Yellow, Green, Blue, Red, Orange and Black. Purple and Brown modules were probably used but those colours are unconfirmed as of this time. Failures usually occurred in the power supplies, buffers, and synchronizers though most problems were quickly resolved. When new, there was a high frequency of failures due to cold solder joints. One board in the KG-13 had a black module which was a noise generator. Repair depot technicians were told it was the only module which was classified because the noise from a diode was used to generate a random key stream used in the encryption process. The circuitry inside the module then used the koken chains to create an extremely random key stream. That was why there was no problem in restarting the KG-13 with the same card. The noisy diode ensured that the chances of duplicating the start point was not measurable by any standards known at the time. Two of the key cards were for the transmitter and the third for the receiver. 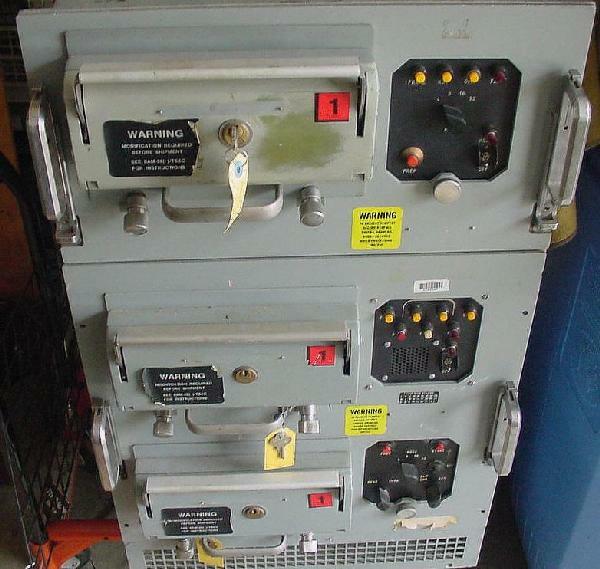 There were two for the transmitter because it had two key generators. The keystream mixed with the plain text produced the ciphertext. Two key generators generating the same keystream should match bit for bit at the output and a mismatch would cause a crypto alarm and a shutdown of the output. A key generator failure would stop transmission and prevent a compromise. With only a single key generator in the transmitter a failure could produce a trivial keystream (all one's, all zero's or alternations). A receiver key generator failure just produced garble. The KG-3 could be used to transmit or receive since there is a XMIT/RECV switch on in the lower right hand portion of the lowest unit. In the 1964/65 time frame, crypto techs were taught that it would take 50,000 years to break the key on a KG-13 using state of the art techniques which were available at the time. The KG-13 also employed traffic flow security. To improve the reliability of the data stream, the KG-13 was used in conjunction with the AN/FYC-3 (dubbed SHARQ). Fred Redick expands on this. "It was an unclassified machine manufactured by RCA and was deployed with the KG-13 on 100 wpm, point-to-point teletype circuits leading to NSA. It also included the network of installations that reported CRITIC  messages to NSA. A device about as large as the KG-13, it was an automatic Error Detection and Correction machine. The letters ARQ in the nick-name SHARQ stand for Automatic Request. It added a cyclic redundancy check character periodically on the plain-text side of the KG-13 and would notify the distant end SHARQ if an error was detected in the data stream and automatically request that the affected block of data be retransmitted. The SHARQ was controlling teletype "step" (later known as clock) so the transmitting station stopped sending while this error correcting process took place. This process took a lot of garble out of otherwise raw TTY traffic. Training on the SHARQ, even for Army folks, took place at Lackland AFB. On later installations, when parts of the world-wide NSA CRITIC network were being upgraded to 1200 baud “high-speed” service around 1970, the AN/FYC-3 was replaced with the AN/FYC-8, an IC based machine. The internal temporary data storage of the AN/FYC-8 used the miraculous but mercifully short lived technology known as “delay line” storage. A delay line was a very long wire of a particular metallurgy that was crammed into a metal box container in the machine. Data coming in one end of the wire took a significant measurable time to get to the other end of the wire plus somehow it was persistent while it was on that wire and so if it wasn’t invited out, it was effectively stored in the delay line". KG-13's were taken out of service around 1989-90. 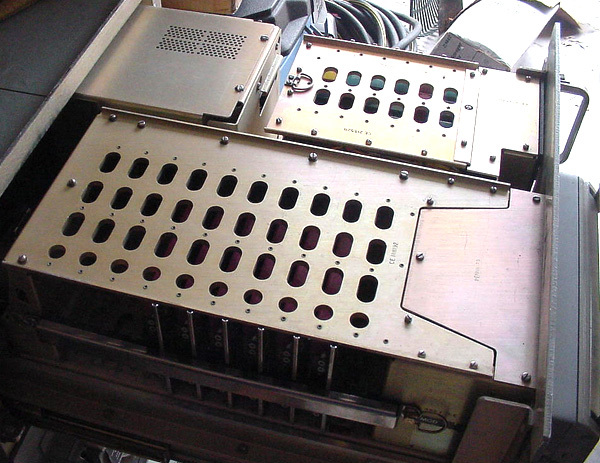 This was one of the last discrete component crypto machines built. 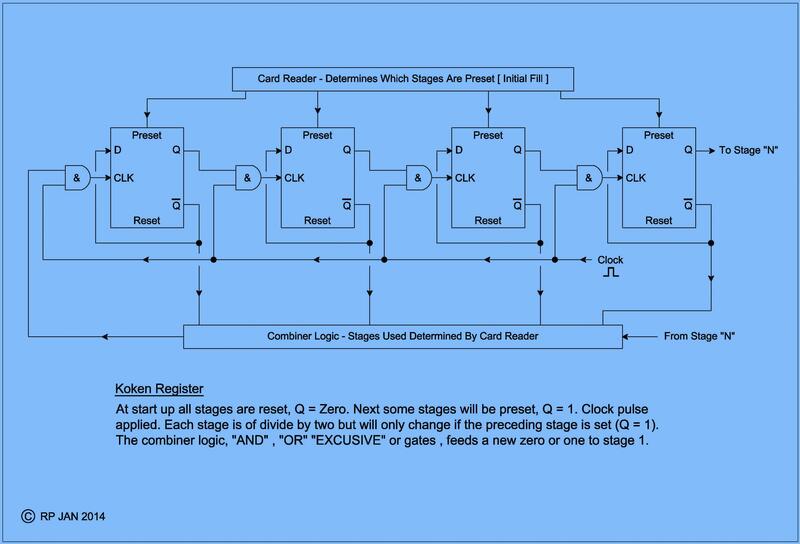 Shortly after this time, integrated circuits started to appear in crypto machine designs. The machine depicted in the above phots was donated to the National Cryptologic Museum Foundation by Bill Rhoads on 19 July 2004. An illustrated article describing its arrival at the museum appeared in the Spring 2004 issue of the NCMF internal publication, "The Link". As of 2010, the KG-13 is in storage. Also refer to Fascinator for complementary information. In mid-1958, a requirement arose for a reporting system that could communicate critical intelligence from the field to the "highest authorities" and with a response time not exceeding ten minutes. A CRITIC message would include any item worthy of urgent attention, such as indications of international crisis or impending military hostilities. A CRITIC message could originate at almost any facility involved with intelligence gathering. It could be from a large fixed station operation with giant antenna arrays, large numbers of radio receivers and data interpretation gear surrounded by scores of analysts. Alternately it could be from a van on a truck in some forward position in a dangerous area. A message with normal priority might take all day to get from the field to a headquarters command. To get to the greater Washington DC area, the total transmission time might be substantially longer. A CRITIC message, therefore, was one with the most urgent priority. The organizational determination to deliver was such that everything else stopped when one was in the network. While in today's world it may not seem remarkable to move a message half way around the world in under ten minute's time but it was an astounding feat given the level of automation prevalent in the 1960s. The establishment of this CRITICOMM system made radical changes in the flow of critical intelligence to Washington.